Shows territorial Nebraska extending to the Canadian border. A beautiful 1855 first edition example of Colton's map of Nebraska and Kansas. This is most probably the rarest and most desirable of all Colton atlas maps. Based on earlier wall map produced by Colton and D. Griffing Johnson, this map details the regions between the Great Salt Lake and Iowa and between the Canadian Border and New Mexico. Covers territorial Kansas and Nebraska as well as parts of adjacent Minnesota, Iowa, Missouri and Utah. Shows Nebraska in its full territorial glory extending from the 40th parallel to the border British America or Canada. This massive and ephemeral territory covered much of what is today Nebraska, Wyoming, Montana, Colorado, North Dakota and South Dakota. Nearby Minnesota is also exceptionally large embracing all of the territory between Wisconsin and the Missouri River. 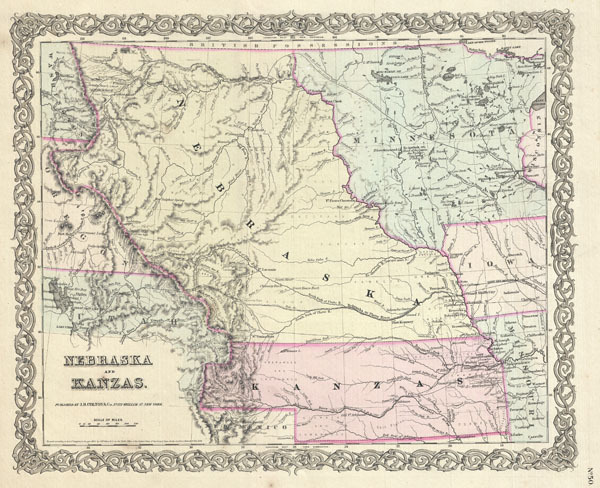 When this map was printed Nebraska and Kansas had only recently been opened for settlement. Both regions were sparsely inhabited by the diverse yet powerful Indian nations of Comanches, Kioways, Arapahoes, Cheyennes, Sioux, Dacotahs, Poncas, Pawnee's, Omahas, Missouris, Delawares, Shawnee, Osages, Crow, Black, and others - whose territorial claims Colton notes. Colton also notes three of the routes proposed for the Pacific Railroad, the Stevens route far to the north, the Beswith route running through the center of the map, and the Gunnison Route passing through Kansas. This map further identifies various forts, rivers, mountain passes, fords, and an assortment of additional topographical detail. Map is hand colored in pink, green, yellow and blue pastels to define territory and state boundaries. Surrounded by Colton's typical spiral motif border. Dated and copyrighted to J. H. Colton, 1855. Published from Colton's 172 William Street Office in New York City. Issued as page no. 50 in volume 1 of the first edition of George Washington Colton's 1855 Atlas of the World. Rumsey 0149.05? (1856 edition). Phillips (Atlases) 816.